Wylie is messed up. She doesn't dare to leave the house, she's anxious and she's grieving for her mother. After she died everything in Wylie's life changed and the atmosphere at home is tense. She feels like she's lost everything, including her best friend. She used to be such good friends with Cassie, but not anymore. When Cassie is in trouble Wylie doesn't hesitate and conquers her fears to help her. She's used to rescuing Cassie, but this is something else, something bigger that she doesn't completely understand. Together with Jasper, Cassie's boyfriend, Wylie leaves the safety of her home. They get instructions from Cassie, but they're just brief texts that don't give them much information. Wylie has a strong feeling that something is really wrong, but getting to Cassie is more important than her own safety. Why does Cassie need her help and who is responsible for taking her? There's more going on than Wylie could have ever suspected and she has no idea what kind of people are behind the disappearance. Will she and Jasper be all right or are they in over their heads? The Outliers is the first part of a promising trilogy. Wylie isn't the most stable person and her feelings are all mixed up. She has such a good heart and wants to be a better version of herself which makes her strong and brave. She's easy to love and to feel connected to. Wylie and Jasper never got along, but during their long drive on the way to Cassie she finally has the chance to get to know him and he's actually a pretty decent guy. The only thing they know is that they have to reach Cassie in time to prevent bad things from happening to her. Nothing is what it seems though, which is what I loved the most about this book. There are secrets, lies and quite a few unreliable characters. There's a lot of chaos and it kept me on the edge of my seat the entire time I was reading. Outliers is a gripping story with many interesting twists and turns and plenty of surprises. Kimberly McCreight's writing is easy to read. I love the way she builds her suspense by creating disorder that messes with the expectations of the reader. 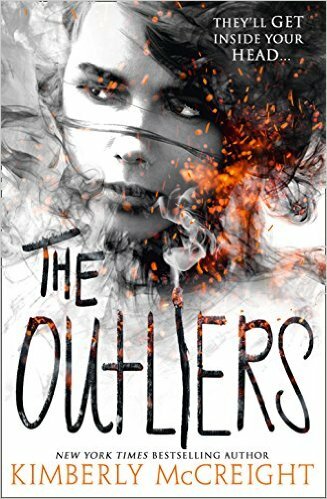 The Outliers is an adrenaline packed roller coaster. Wylie and Jasper are on their way to Cassie, but they're also on the run. When they finally reach their destination the story becomes completely different and it keeps changing several times, a bold move that works very well. I really liked this book and ﻿I already look forward to reading more of Kimberly McCreight's work. Oh my goodness, this cover! It looks like a really gutsy book. Sounds like a real page-turner! This sounds like a great thriller.